The Boston Massachusetts Temple is the 100th operating temple of The Church of Jesus Christ of Latter-day Saints. The Mormon Church dedicated the 100th operating temple in Boston Massachusetts on 1 October 2000. President Gordon B. Hinckley had announced the building of small temples in the April 1998 general conference and then stated the goal to have 100 temples built by the end of the year 2000. The Boston Massachusetts Temple marked the completion of that goal. The Mormon Church has its roots in New England. The Prophet Joseph Smith was born in Vermont and once visited the city of Boston. The first Mormon missionaries were sent to Boston in 1832. At the time of Joseph Smith's assassination there were over a dozen congregations in the area. But most members moved west with the rest of the Latter-day Saints. It was almost fifty years before members of the Mormon Church were found in Massachusetts again. Since that time there has been a steady increase in the number of members. Now there are over 16,000 members in Massachusetts. Elder Richard G. Scott, of the Quorum of the Twelve Apostles presided over the groundbreaking on 13 June 1997, and the building was completed three years later. The open house of the 100th Mormon temple captured media and public attention. 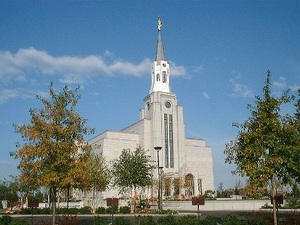 About 82,600 visitors toured the temple prior to its dedication. A local radio station and newspaper working together produced the first on-line tour of a temple. It included narration accompanied by photographs of the temple's interior. His optimism was rewarded when next May the Supreme Court of Massachusetts ruled in favor of the Church. Previously, Judge Elizabeth Fahey had ruled that the building's steeple was not a "necessary element of the Mormon religion." Therefore under the law the building height limit could be enforced. But the Supreme Court overruled her ruling saying, "A rose window at Notre Dame Cathedral, a balcony at St. Peter's Basilica, are judges to decide whether these architectural elements are 'necessary' to the faith served by those buildings?" The judges concluded that, "It is not for judges to determine whether the inclusion of a particular architectural feature is 'necessary' for a particular religion." On September 21, 2001, the steeple with the famous angel Moroni was set in place, completing the Boston temple. The Boston Massachusetts Temple is relatively large with a total of 69,600 square feet, four ordinance rooms, and four sealing rooms. The exterior is finished with Olympia white granite. This page was last edited on 24 January 2012, at 11:39.